Explain the basics of high-pressure decorative laminate (HPDL). Detail design considerations and choices for HPDL doors. 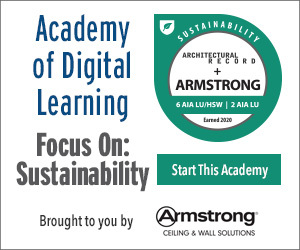 Discuss the main industry construction standards relevant to HPDL wood doors. From aesthetics to performance, today’s high-pressure decorative laminates (HPDL) are becoming an increasingly popular door surface application. With recent technological improvements in manufacturing and materials, HPDL doors offer an abundance of varied design choices, as well as provide significant cost savings, performance achievements, fire safety, and environmental benefits. Simply speaking, the face material is the main difference between a laminate door and a wood veneer door. Compared to laminate doors from bygone times, today’s versions feature improvements in virtually every element and process, with the results including more detailed patterns, more authentic or true-to-life surfaces, stronger bonds to substrates, advanced resin surface chemistry for easier maintenance, manufacturing processes that prevent delamination of edges, and increased recycled content. This course will examine the construction and many uses of HPDL doors and provide an overview of the nearly endless design options, performance, safety, and cost factors, as well as sustainability considerations of their use in all types of commercial projects. 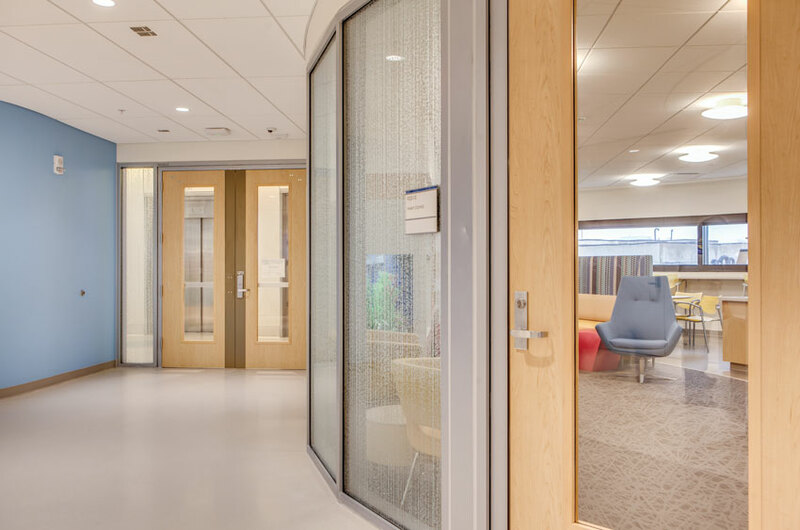 HPDL doors provide a comfortable, clean feel at the University of Iowa Stead Family Children’s Hospital. Why and Where are HPDL Doors Used? HPDL doors are used in design for a variety of reasons, the first being to prolong the life of an opening in high-traffic areas or areas that are prone to abuse. Examples include patient rooms and double egress doors in hospital corridors or classroom doors in schools and universities. Additionally, HPDL doors are used in design for areas that require high visual impact or to create a focal point. For example, custom laminates can feature team logos for stadium applications, or a company’s logo for office buildings. Exotic wood-look laminates are also popular in multifamily and hospitality applications where durability and sustainability are important. In other words, HPDL doors can be used in just about any commercial or multifamily setting where style and function are required. High-pressure decorative laminate is comprised of several layers of brown kraft paper filled with phenolic resin for flexibility and a high-quality decorative print paper saturated with melamine resin or an overlay dipped in melamine for strength and durability. They are compressed under high pressure and heat for an extended period of time, approximately 1,400 psi at 300 degrees Fahrenheit for 30 to 40 minutes. Overlay paper, which serves to improve the abrasion, scratch, and heat-resistance. Decorative paper, which defines the design and is composed of colored or printed paper. The number of kraft/phenolic layers in each sheet of HPDL determines its thickness. In the actual process, the raw paper is first dipped in a resin bath and dried, and, as noted, the laminate is then assembled with kraft paper and melamine-treated decorative paper or overlay; a textured metal plate then determines the finish properties. The bottom layer of kraft paper is sanded to provide proper adhesion between the laminate and a substrate material. For best results, door edges, which are usually finished with the same laminate as the face, must be applied first to reduce the potential for chips and to hide the seams. When designers opt to have the edges painted or stained, factory finishing almost always provides the best outcome for a look that is both polished and consistent. After the papers are saturated with the resins, the three layers of paper/resin are placed into a press that simultaneously applies heat and pressure. The pressing operation allows the thermoset resins to flow into the paper, then subsequently cure into a consolidated sheet. During the press cycle, the decorative surface can also be cured while in contact with a textured surface to create one of many different surface finishes. HPDL consists of more than 60 to 70 percent paper, with the remaining 30 to 40 percent a combination of phenol-formaldehyde resin for the core layers and melamine-formaldehyde resin for the surface layer. Both resins belong to a class of thermosetting resins that crosslink during the press cycle, creating irreversible chemical bonds that produce a nonreactive, stable material with characteristics different and superior to those of the component parts. The manufacturing process begins in the receiving area where the raw materials, including decorative paper, overlay paper, and kraft paper, are inventoried. Decorative paper provides the pattern, woodgrain, or solid color for a sheet of laminate. Overlay paper provides surface strength and scratch-resistance properties for the laminate. The overlay paper is sent through a melamine treater, where it undergoes melamine resin saturation, and is then cured and rerolled. Kraft paper makes up the "core" of the laminate. Kraft paper goes through a phenolic treater, is saturated with phenolic resin, and then is cured and rolled (or sized and cut to sheet size, as required). Next, the laminate goes to the sander, where each sheet’s edges are trimmed. Then the back of the sheet is sanded down in order to facilitate bonding to various adhesives in fabrication. Sheets are then cut to size, and the manufacturer stores the finished product prior to shipping to its destination. Raw materials are received and inventoried. A stack of paper and plates roll into the press. The press cycle combines high heat and pressure. The resins allow the paper to fuse together for the finished laminate sheet. The backs are then sanded to facilitate bonding to various adhesive. This shows the manufacturing process for HPDL. The raw paper is dipped in a resin bath and dried. Then the laminate is assembled with kraft paper and melamine-treated decorative paper or overlay. The textured metal plate then determines the finish properties. HPDL at various stages of the production process.